My husband doesn't need more cuff links, socks or ties. For me, the perfect Father's Day gift is personal and ideally home-made with input from the children. Unfortunately, I'm not particularly blessed with art and craft talent. 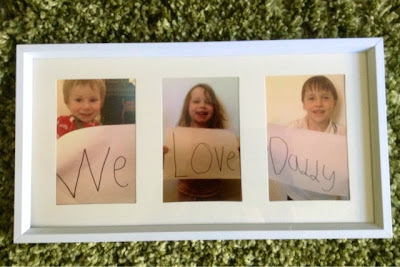 But when I saw this idea - photos of three children, each holding a handwritten sign saying 'We', 'Love' and 'Daddy' - on Pinterest, it fitted the bill perfectly. Even better, it cost less than £5 to make. If you have more or fewer children, you can adapt the signs to any message you like. My 6 year old wrote the signs and we took the photographs using my iPhone. The 6 year old and 3 year old posed beautifully for the photos, but the 23 month old was less co-operative. I tried holding him and the sign while the 6 year old took the photo, but the results were a bit blurry, so I ended up sneaking a quick selfie. We printed the pictures for less than £2 on the self service machine in 'Boots'. We then bought a frame for £2.99 from the local 'Home Direct' shop. The children and I are really pleased with the results and I'm pretty sure my husband will love it too. I'm sure if I was a better photographer, it might look even more like the example I saw on Pinterest. What gifts have you made for Father's Day? Lovely! We've been a bit frantically busy the last few days, so even though the children came home from pre-school on Friday and reminded me that it was Father's Day and they needed to make a card, he still only ended up with a cuddle. We'll have to make up for it some other time!